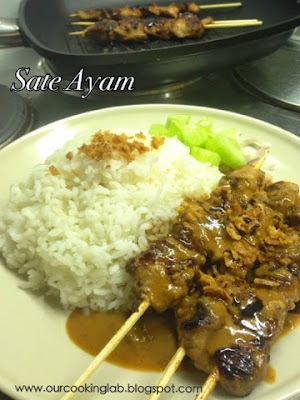 It's an easy dish to prepare and surely a favorite dish to serve when you miss home (Indonesia). This time I used instant sate sauce that I bought in Indonesia. 1. Marinate chicken breast in all ingredients (except margarine) for 4 hours in fridge. 2. 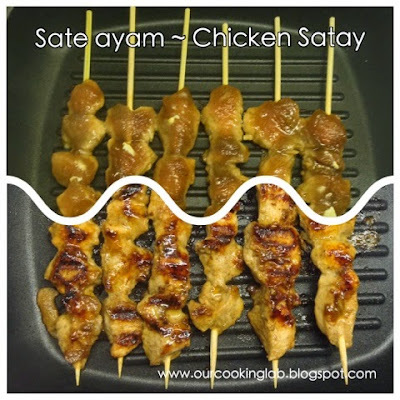 Thread the chicken cubes onto bamboo skewers and grill for 2-3 minutes each side. 3. Serve with rice, peanut sauce, sweet soy sauce, slices of shallots and cucumber.